In this activity, students analyze data detailing global energy sources and sinks (uses) and construct a diagram to show the relative scale and the connections between them. Discussions of scale; historical, socio-environmental, and geographic variation in this data; and implications for future energy use are included. Educators will need significant preparation time to facilitate this lesson. Educators may wish to have students use more recent energy data from the International Energy Agency. The resource material can be used for different types of exercises on regional/national/global levels. Students could be broken into different groups (regions) and share their pie charts and Sankey Diagrams and discuss what kind of policies might be needed to have sustainable energy development. All data in this activity comes from the United Nations 4th Inter-governmental Panel on Climate Change (IPCC) published in 2007. Students may wish to use more recent data that reflects recent downturns in economic activity. Comments from expert scientist: This activity set is well-written, easy to understand, addresses a very important topic for increasing energy literacy. The materials assume an instructor and/or student inherently understands the definition of "source" and "sink." Discussion questions are interesting and answers are provided. The use of real energy flow diagrams and data is excellent. The resource contains excellent step-by-step instructions for teachers and support materials for the students. Students will require prior knowledge about renewable and non-renewable energy sources, basic physics concepts related to the transformation of energy and matter, and the joule (J) as a unit of energy. 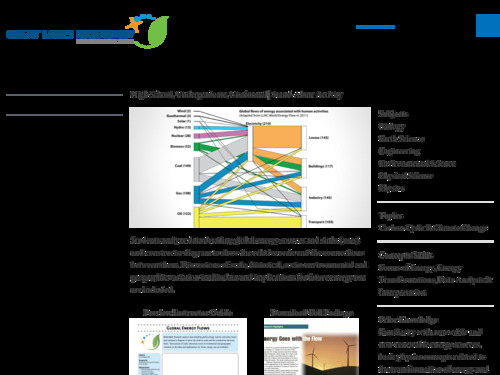 The high-quality Global Energy Flows package include Teacher Instructions and Answer Key, Student Pages, Global Energy Flow Graph Slide Set, IPCC Chapter 4, Energy Consumption by Source Raw Data.